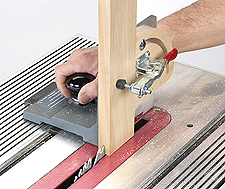 Perform specialized cuts with Shopsmith Tenon Master Jig it holds your work piece exactly perpendicular to the table surface for accurate, square cuts. Rating: 4 out of 5 Very nice jig - I don't think you'll be disappointing. I bought this to do a project where I had to cut a spline joint in the end grain beveled at 45°. I was trying it out on some trial pieces and this thing works great! The quality of the casting is very good and it's got a nice solid miter bar and base. It was easy to set up and use. The only reason I didn't give it 5 stars is related to the toggle clamp. The clamp quality is nice, but the threads on the plunger assembly were so bad I couldn't run the nut on the stem far enough to adjust for the stock I'm using. So I swapped the entire toggle clamp for a slightly larger one I had in my shop. Based on the quality of the rest of the jig I suspect the problem I had was unusual, but it did cause me to substitute parts to be able to use it without going through any delays or return hassles. Rating: 5 out of 5 This is a phenomenal jig for tenons. Once set, it's repeatability is astounding. I love it!